If watching Rally Driving on TV excites the rally racer within you - imagine the thrill you will get when you actually experience what it's like to drive a Turbocharged WRX on dirt! 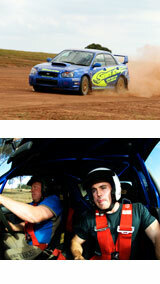 The Ultimate Introduction To Rally Driving in Brisbane. Rally driving is one of the most thrilling motor sports to watch on TV and one of the most mind-blowing motor sports to witness live. 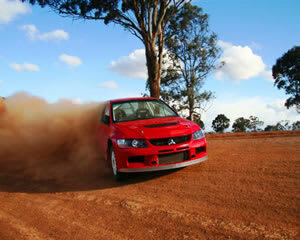 Imagine then, how it must feel to be in the rally car, at the controls, on your very own rally driving dirt track. During this rally driving session you'll be strapped into the race seat of a competition-prepared Impreza WRX or Lancer Evo for a taste of the extreme skills and total thrills offered by rally driving. After eight laps of high-octane rally driving madness, your ear-to-ear grin will be stretched even further when a professional hops behind the controls of the turbocharged WRX or Evo to take you on a rally driving hot lap, so hook in and hang on! Afterwards, if you find you suddenly have a taste for more rally driving action, you can book yourself into a half-day or full-day rally driving course in the Australian Rally Championship 4WD Turbos. Loved it! Will do it again! Very enjoyable experience. Well worth while participating. Brilliant day...apparently all I was doing was giggling the whole way round lol. I've nothing else to add! My partner David Dowe did this on the day and loved it. He said the driver Luke was amazing and has recommended it to all his mates. I had a great experience with Adrenalin. The day before my partners Rally Car experience, I rang to confirm the time - and I am so glad I did! I had wrote down the wrong time, and the lady on the phone tried to fit us in at that time but unfortunately the day was booked out. She sent me the confirmation email again straight away and was very kind and helpful. I would definitely reckoning Adrenalin to anybody wanting to experience something for themselves or wishing to give somebody the perfect gift! I would recommend the activity but would advise those that it is ovecontrolled.